A number of strong, militant protests against the government of Michel Martelly have taken place in Cap-Haitien, the second largest city in Haiti, in the past few weeks. Demonstrators have burned tires and held mass marches. Haitian cops and Minustah — the United Nation’s occupying force in Haiti — using tear gas and live rounds, fired into the air, forcing demonstrations back from government offices. Some 20 popular organizations and outspoken opposition figures Sen. Moïse Jean-Charles and activist leader Pierrot Augustin called the protests. Michel Martelly is the Haitian president that the U.S. maneuvered to install last year. Marchers yelled, “Down with Martelly! Down with corruption! Down with expulsions! Down with the high cost of living!” “Expulsions” is the term Haitians use to describe what happens when a big landowner kicks peasants off land that the peasants have been tilling, sometimes for decades, to eke out a living. Protests, general strikes, picket lines and marches over these issues took place in many other parts of the country, as well as in Cap-Haitien. In Les Cayes, Haiti’s third largest city, people widely honored the Sept. 14 general strike. Most businesses were closed, including gas stations, public markets and mass transportation. Small business owners in the south of Haiti, where Les Cayes is located, previously supported Martelly but have moved into opposition over growing lawlessness and arbitrary taxation along with blatant corruption. The even poorer workers, peasants and unemployed of Les Cayes gave them plenty of support. The day before the strike, the state secretary for communications, Joseph Guyler C. Delva, showed up in Les Cayes with 400,000 gourdes ($10,000 U.S.) to bribe local leaders to call it off. When Delva debated a local opposition figure named Gabriel Fortune at the Les Cayes radio station, demonstrators, many of them former Martelly supporters, gathered outside the station and accused Delva of being “a defender of the devil” and the Martelly government’s “propaganda chief.” (Haïti-Liberté, Sept. 19) The cops had to be called to get Delva out of the station safely. The many demonstrations in Port-au-Prince, Haiti’s capital, protested the general issues of corruption, incompetence and subservience to foreign financial institutions and raised the particular needs of the organizations calling the protest. On Sept. 10, the National Union of Haiti’s University Teachers (UNNOH), led by professor Josue Merilien, marched through Port-au-Prince to demand open access to the school system in Haiti for all students and decent wages for professors. 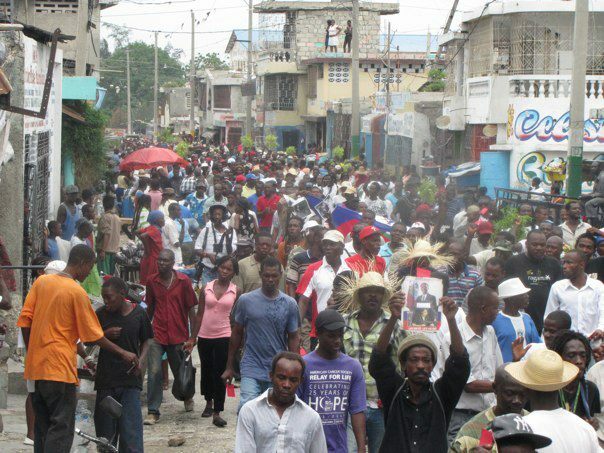 The next day, the Movement for Liberty, Equality and Fraternity for Haitians (Moleghaf) demonstrated for job creation, a change in the living conditions of marginalized populations and a lower cost of living. On Sept. 12, the Platform of Victimized Employees of Public Enterprises (Pevep), consisting of hundreds of people laid off illegally and arbitrarily from state enterprises, demonstrated to get their jobs back. Pevep says these dismissals were the result of neoliberal policies that the U.S. government and international financial institutions forced on Haiti. Even though the children of Pevep members were on the march, when they went by the earthquake-wrecked National Palace, which is currently being torn down by an NGO, the cops attacked with tear gas. More demonstrations took place in Port-au-Prince and smaller Haitian cities, and there have been calls issued for some later in September. Popular anger against the Martelly clique is growing and events don’t seem to be breaking his way.